Dancing requires specific shoes, depending on the type of dance that you’re doing. We’re here to help you find the perfect shoes for whatever type of dance you’re doing! We’ve done a ton of research and reviewed an abundance of shoes to bring you only the best. Before we get started, here are some things you should know about dance shoes. Afterward, check out all of the amazing dance shoes and get your groove on! Style: What type of dance are these particular shoes best suited for? There’s something here for everyone, from tap dancing to hip-hop, jazz to ballroom dancing. Choose the shoes that are the best fit for your dance style. Color: This is the color that the shoes come in. Keep in mind that they also come in additional colors in most cases, so that you have the option to match your dancing and performance outfits. Black is common. Gender: The gender that they’re made for is important in dance shoes. Men and women’s shoes are going to fit differently and support the wearer in different ways. Plus, the sizing is different for each of gender. Age: Does it come in adult and child sizes? Some of the shoes on our list do. It allows younger dancers to get used to the adult-style dancing shoes that they will eventually wear. They look great in either size range! Material: What are the shoes made of? This material usually refers to what the main part, or upper, of the shoe is made of. It can determine how comfortable and breathable a shoe is, as well as its flexibility. Heel Height: How high is the heel? Of course, ballroom shoes are going to have the highest heels, especially women’s. Ballet shoes should have no heel or very little, and the rest of them depend on your preference. Now that you know all about dance shoes, we can get into the reviews. Each of these shoes has their own benefits and perks, so you should check them all out. The top pick and budget pick are our personal favorites, so take a look at those first. We’re sure that you’ll find your new favorite dance footwear on our list! With these shoes, you can get your groove on in comfort and style! 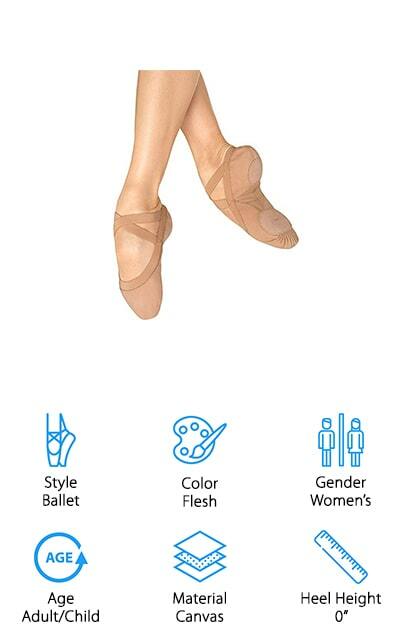 Our choice for the best shoes for dancers are these multi-purpose shoes by Capezio. They come in either black or white, so you can match the rest of your dance outfit. These shoes work for a variety of dance styles; the split-soles and sturdy toe box make them great for ballet, and the spin spots on the sole are great for jazz dancing. The tongue and collar are padded for a comfortable day of dancing. The footbed is made of molded EVA that is removable and contoured to the shape of your foot. Their arch support is phenomenal, and the outsole is made of polyurethane with flex points and the spit spot right on the front center to help dancers get their twirl on. The sports lace system allows you to adjust the tightness of the shoe. Where this shoe really shines is in the ankle support department; do your dance moves with plenty of support! 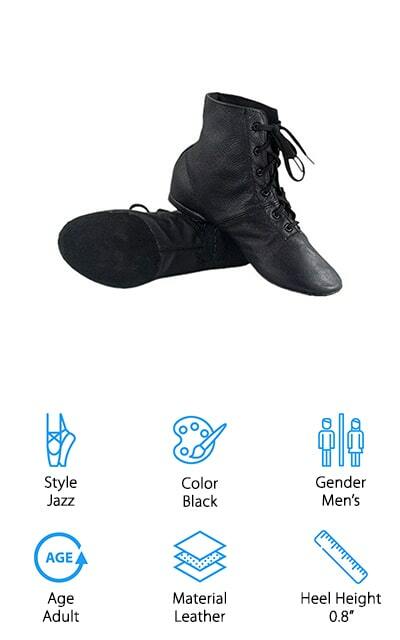 These shoes by Tent are made specifically for jazz dancing. They use a simple unisex base. 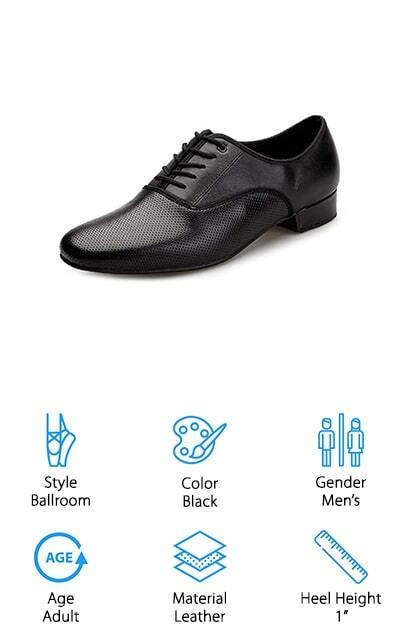 For men, add 1.5-2 sizes to your regular size to get the perfect fit in these jazz shoes. For women, only add a half a size to get the right adjustment. The split sole and flexible, soft leather makes it easy to use for the step sequences in jazz dance. The cotton lining makes it comfortable on your feet even if you’re practicing all day long. Plus, they come in a neutral brown color in addition to the default black to match a wider variety of dance outfits. They also work well as gymnastics shoes, due to the maximum flexibility offered by the split sole and cotton lining. Get every step down perfectly and comfortably with these amazing jazz shoes by Tent. We love the universal size and the level of flexibility that these shoes offer. You will too! 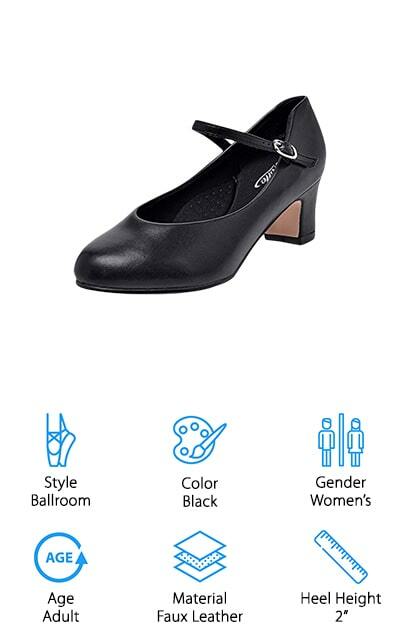 This dance shoe by Capezio is made for ballroom dancing. They look like perfect black loafers, but they have the support and heel that is critical for different forms of ballroom dancing. They are lace-up shoes that are made of faux leather, with a bottom that is covered in suede to help absorb shock. The sponge insole also helps to absorb the shock from dance moves that might otherwise damage your feet. They are lined in cotton to help absorb moisture and include a comfortable Achilles notch as well as a padded collar. The EVA heel is wrapped with leather to make it match the rest of the shoe. We love that instead of being hard like regular dress shoes, these dance shoes have made style comfortable! These are some of the best shoes for dance that we came across in our research because they are made with comfort and style in mind. You don’t want to miss out! These STELLE shoes have a 2-inch heel that makes them great for ballroom dancing, or for dancing in plays and musicals. As an added bonus, the classic black design also matches casual outfits and work outfits, so you can wear them on the clock as well as during your dance sessions if you feel like it. They run true to size, so your street size should perfectly match the size that you get here. They are super comfortable shoes made of imitation leather that is soft and flexible. The lining is a breathable material that stops your feet from sweating. They come in tan as well as the black color, and the rounded toe means that they won’t get pinched during your dance routine. The footbed has a memory foam cushion that will help your feet feel great all through practice and your routine. The soft innersole keeps blisters away as well, so you can dance your best! A lot of people do Latin-style dancing as an exercise routine, and these shoes by GetMine are some of the best shoes for dance fitness that we found. 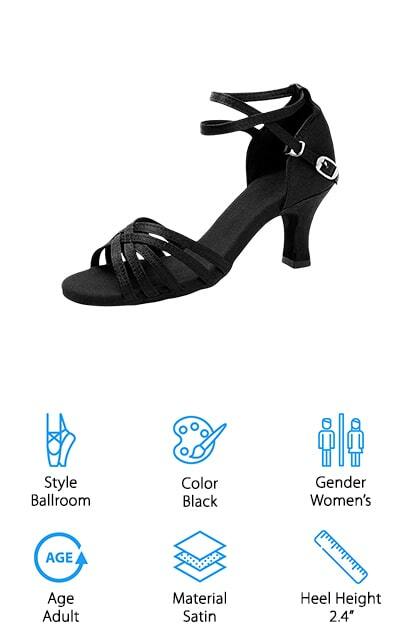 These are great, comfortable shoes for Latin-style ballroom dancing, with a non-slip suede sole that will work perfectly on indoor dance floor conditions. They provide great balance and skid resistance, so you have the most stable basis for your step sequences. The 2.4-inch heel is gorgeous and high enough to make your dances look graceful and flawless. They are made of satin on the upper, which is a soft, flexible material that looks great on the floor, as well as quick-release buckles to get them off your feet quickly between performances. They come in eight beautiful colors, including metallic silver and gold, and an alternative version of the black color with a rubber sole rather than suede. These gorgeous shoes are entirely true to size as well! 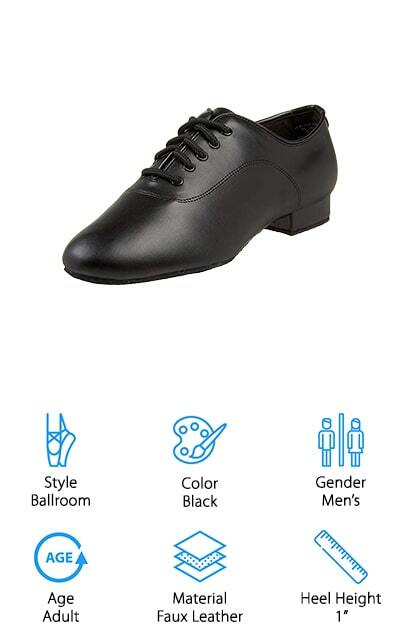 Men need ballroom dance shoes as well, and that’s where NLeahershoe comes in. These ballroom shoes are non-slip and lightweight, so they are comfortable enough for your entire practice session or performance. The uppers are made of comfortable, smooth leather that will move with you, with breathability in the form of ventilation holes. Your feet won’t feel sweaty even after wearing these shoes for a long time. They recommend that you choose a size larger if you have wider feet so that you can get a comfortable fit. The 1-inch heel helps to lengthen the appearance of your calves and make you look even more graceful during your dance performances. The outsole is made of suede to help you burn more easily on an indoor dance floor. You can use them for a wide variety of different ballroom dancing genres, including Latin and Waltz dancing. They’re versatile and comfortable no matter what your dancing style is. 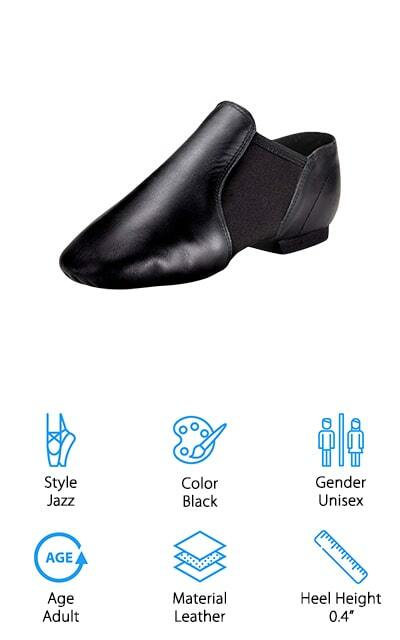 Men’s jazz shoes are sometimes difficult to find, but that’s where we come in! These boots by Cheapdancing will help you achieve all of your jazz dancing aspirations. The entire shoe is made of soft, pliable leather, including the outsole. That means it’s flexible enough to handle all of your dance moves. They’re extremely durable at the same time, made of premium leather that won’t wear down over time. They are lace-up shoes, which will help you secure them tight enough that they don’t slip off or slide down while you’re dancing. The outsole makes it easy to do your turns on the dance floor. They’re unique because you can pivot with ease, but you won’t slip all over the place while you’re dancing. No matter whether you’re going in for jazz, Latin, or waltz-type ballroom dancing, these shoes will keep your feet in the game for sure! You’re going to love how comfortable they are! If your child is looking for some good shoes to dance in for her next tap class, these are the shoes for you! They are made with comfort in mind while observing the unwritten ‘rules’ about how tap shoes should ultimately look. They have a cashmere lining for reduced moisture and increased comfort, as well as a balance pad to help you transfer weight better from your heel to your toe. And by the way, these shoes come in a range of sizes – from toddlers to child’s sizes, as well as lady’s sizes. Each size range can come in black, white, or tan so you get the perfect look for each performance. The heel is made to minimize rubbing on your heel, so you don’t have any blisters pop up. 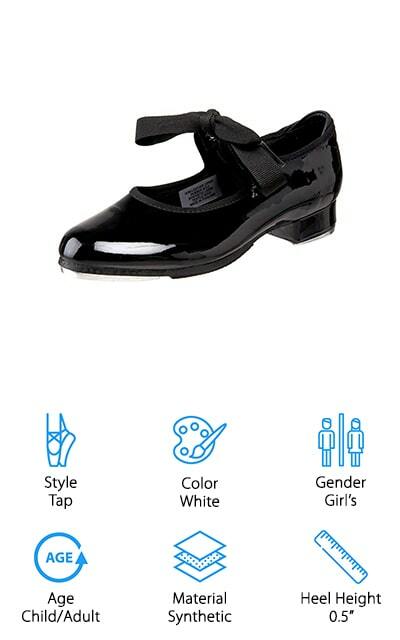 The black shoes are made with glossy leather, while the white and tan versions are made in a synthetic material. These are beautiful, comfortable tap shoes! Bloch makes these traditional ballet slippers that any ballet dancer will enjoy. They are made of a comfortable canvas material that your feet are going to love dancing in. The foot portion has built-in elastic contours to relieve some of the pressure on your Achilles tendon during the rigors of ballet dancing, and that’s a really useful feature. The triangle arch insert gives you a tight-fighting slipper when you point your toes, for a great look and phenomenal support during the most delicate of dance moves. This entire shoe is shaped and supported to help support your feet, which are a ballet dancer’s best asset! They come in this flesh color, as well as black and pink for whatever outfit you’re wearing for the performance. They are also ridge-free, so your feet don’t bruise during the more delicate and weight-bearing ballet maneuvers. Every consideration was taken in the development and construction of these amazing slippers. The last shoes on our list are these Hip-Hop dance sneakers that are some of the best shoes for aerobic dance. They are made of canvas and come in a universal size that you adjust personally. For women and girls, you must order the same size as your regular shoe to get the perfect fit. Men and boys should order two sizes larger than the shoes they regularly wear to get the same perfect fit. 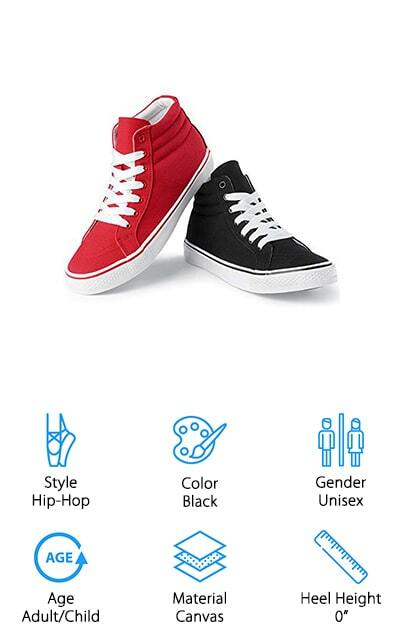 They are high-top dance sneakers with great support that include a padded collar. The cotton lining makes it comfortable and breathable, while the rubber outsole gives you added durability and won’t mark up any surfaces you’re dancing on. These are some of the best shoes for dance cardio because they allow you to groove without slipping and sliding. When you’re looking for sturdy shoes to support your dancing wherever these are the sneakers you need! 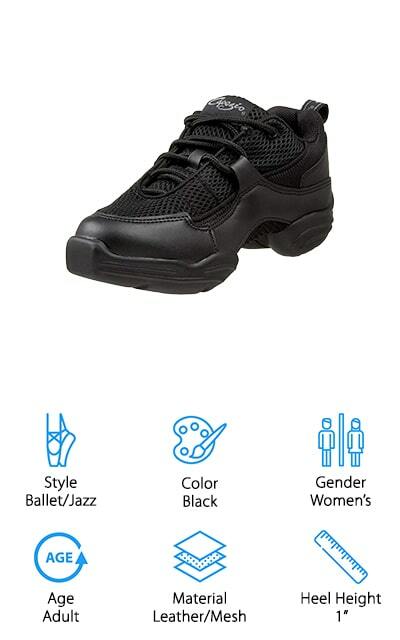 They work especially well for street and hip-hop dancing performances.